CM Magazine: Fiendish Deeds. (The Joy of Spooking; Bk #1). Fiendish Deeds. (The Joy of Spooking; Bk #1). New York, NY: Margaret K. McElderry Books (Distributed in Canada by Simon & Schuster Canada), 2008. Grades 4-7 / Ages 8-12. True, Spooking was a bit rundown. The looming ornamented houses, no longer fashionable, were mostly left to fall in on themselves these days. The remainder of the town was no better, really. Once a lush landscaped arboretum, the rambling park off the boulevard had become a neglected mess of tangled woods and cascading ponds dripping brown liquid into each other. The red brick library stood locked and lifeless, its vast collection of books gathering dust inside. The children's playground looked like a wreckage of some old bomber shot out of the sky. Across from the playground, the high walls of the Spooking Asylum blocked not only the view but even the sun most days. The asylum walls continued down toward the centre of town where a few shuttered little shops sat silent and empty. Then there was the old cemetery that was about it. But to Joy Wells, of Number 9 Ravenwood Avenue, it was everything. She closed her heavy curtains with a heavy sigh. In Spooking,12-year-old Joy Wells has found the perfect home for both her family and her imagination. Inspired by The Compleat and Collected Works of E.A. Peugeot, Joy and her reluctant brother Byron explore the Spooking bog for signs of a horrible monster or even the bog fiend. In Fiendish Deeds, author P.J. Bracegirdle also reveals that suburbia, a monster more terrible than a bog fiend, is threatening the unique beauty of Spooking and even of characters like Joy, herself. Yes, the dreaded s word is attempting to creep up the hill to Spooking and suffocate the Spookys with the order, modernity, and automated sprinkler systems the Darlings of Darlington love so much. Joy Wells must protect the integrity of Spooking from the Darlings who seem unable to find the beauty in the mysterious old bog and general Spooking spookiness. The Misty Mermaid Water Park is planned for development on the Spooking bog by the miserable ex-Spooky Mr. Phipps. He has a goal to smooth out the oddities of Spooking by transforming it into more Darlington sprawl. Mr. Phipps is truly evil. Joy, always grappling with the real and fake monsters in her life, fights for the rights of Spooking and Spookys against the Darlings. However, class bullies, Mr. Phipps, and even her teacher, are incapable of understanding her passion for the strange and haunting town of Spooking. In Fiendish Deeds, Bracegirdle uses dark humour and sarcasm to draw the reader into the story, the atmosphere of Spooking, and the character Joy. Strange and quirky, Joy is obsessed with ghastly supernatural possibilities, and she dresses in a deceased old woman's clothing to complete her adventuring ensemble. Bracegirdle pokes fun at the oddities in Joy's character, so that she felt like a loved sister or good friend with whom I was adventuring. I enjoyed every minute I spent reading this book. Bracegirdle's wit and literary style create a truly macabre mood in the story that is compelling and fun to read. References to Edgar Allen Poe provide a glimpse into literary history without being didactic, and environmental issues, bullying, and development are also woven into the story without heavy-handed didacticism. While I was curled up inside my apartment in rainy Vancouver, Bracegirdle's deliciously dark narrative tone transported me from my green fleecy blanket right into Spooking. The language is consistent, the characters are strange and wonderful, and the plot is full of bizarre twists. 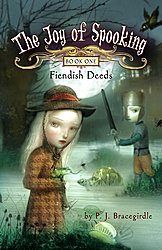 Fiendish Deeds is an impressive first novel for P.J. Bracegirdle. Brianne Grant is a student in the Master of Arts in Children's Literature at the University of British Columbia and the Executive Councillor-West for IBBY Canada.